CrossFit’s many aspects are the best and worst thing about it. This shows up in everything from training to equipment – you need the right equipment to meet a whole bunch of demands at once. We’ve seen this with footwear, and the many variations of Reebok’s Nano shoe. The simple fact is that a piece of equipment for cross-training needs to be versatile. The hand grip is another perfect example. If you want to keep your hands healthy on the rig, the bar, and any other obstacle you come across, these grips are essential. You’re going to be putting a lot of work through your hands and you need the option to protect them before they rip! Today, we’re going to take you through what you should be looking for in a hand-grip, and what makes the best CrossFit hand grips! 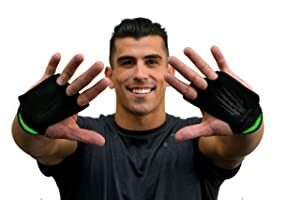 What Should You Look for in a Crossfit Hand Protector? Here are our top 2 picks. Or you can find more detailed reviews below. The purpose of a hand protector is, first and foremost, to keep your hand-skin healthy. We’re all familiar with torn callouses and just how much they can disrupt a training session – you can’t do anything with an open palm or a grip-intensive workout. 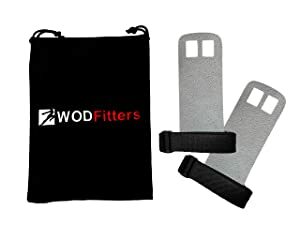 Durability and protection come first, but they also need to be light-weight enough to be able to deal with weightlifting movements, kettlebells, and anything else you might come into contact with. 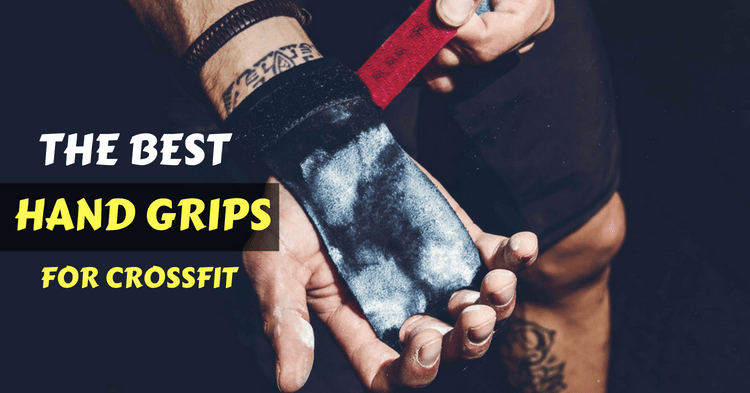 This is why CrossFit has their own brands – the gymnastic hand grips aren’t built to deal with the variety of movement necessary. Beyond that, they need to afford your wrists enough freedom to move through full range of motion, be well-made, cost-effective, and implement any other features very well. The design is well-known, so any innovation has to be really positive and reliable. With a 2- and 3-hole option available, the Bear KompleX grips are off to a good start! The construction is an essential part of why we like these grips – they’re hardy and flexible, made of soft-but-resilient leather. The leather design is perfect because it balances the resilience you need with the “grippy-ness” and function you need. 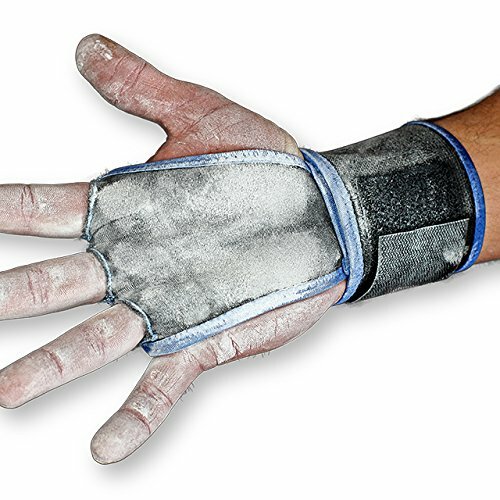 They’re not too ‘sticky’ on the bar (which can cause tearing and difficulty in moving), but they’re not going to slide and add to your grip – as well as protecting your hands. The design specifically aims for strength and durability, while avoiding any impediments to wrist mobility. This means you’re going to have full movement in the wrist for weightlifting, strength training exercises, kettlebells, dumbbells, wall balls, or whatever else is in your WOD. The stitching quality is an overlooked but essential part of a good grip. The Bear KompleX grips boast a triple-stitched stress-point design so you’re not going to lose them halfway through a workout because of stitch weakness. The main complaints that customers have relate to discomfort at the start of use. The problem here is simply that leather requires breaking in and you will have an adapting process to using them if they’re your first leather grips. To get around this, try soaking the grips in warm water, working them, and then try wearing them for your workouts. The ProFitness grips are designed using suede leather for a softer product and a more ergonomic design. They’ll grip to your skin without binding, and they won’t require just as much breaking-in as a full-leather product. These are also available in 2- and 3-hole versions. This design is likely to provide a slightly less-durable grip than the full-leather but this is the other side of a more flexible design. They’re still of a great build-quality, and you’ll find that the breathability of this product is great for keeping your hands drier, reducing blisters and tears. Even if the product does take serious damage, it includes a lifetime warranty. This means that, even if they break down after a few years, you’re entitled to another pair without charge. This is a great back-up to have as it means you’ll never need to buy another pair – a sense of reliability and assurance that is useful with this type of product. Negative reviews on this product are very scarce, and tend to be from people who bought the wrong size. Make sure you check in with the size guide and get accurate measurements based on your hand measurements or, better still, other trainees’ grips! You need to know what size to buy or the functionality will suffer! 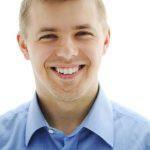 Occasional problems with fit – double-check your sizing! WODies are novel on this list as they’re the first neoprene/synthetic product. They don’t provide the same leather grips, but they pride themselves on being washer-dryer safe. This isn’t a massive selling point, but it does bring its own benefits and drawbacks – as you’ll see! The first thing that strikes us about these grips is the addition of a connected grip and wrist support. This might seem like a great idea, but it is certainly going to be a problem for any weightlifting movements, and anything that requires an extended wrist position – such as a wall-ball. These aren’t optional movements, and blocking wrist-movement will risk injury and certainly damage technique. 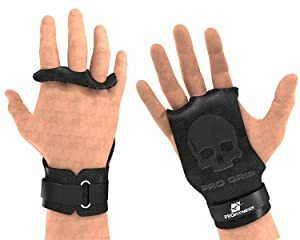 These grips are great for movements like ring dips and pull-ups, where the position of the wrist is relatively fixed. However, they lack the versatility we talked about at the start of this article: they’re not well-adapted to the various needs the CrossFit trainees have. The build-quality also raises some concerns. While the neoprene-elastic material may be flexible and light-weight, it is unlikely to provide the same quality as a suede or leather product. With a weaved fabric design, there’s an increased risk of tears and damage to the hand-protection. With a 20% critical review feedback, primarily centring around build-quality and a general lack of grip. This is obviously a problem, as that’s the main goal of the product! Pheral Fit returns us to the leather grip. They’re a 2-hole grip that protects the areas of the palm that are most susceptible to damage and callouses. The rugged, coarse leather build on the palm provides great grip and protects you from the risks of gnarled hands during your next WOD. The balance of smoothed and ruggedized leather means you’re going to have grip on the bar but you won’t be stuck to your grips – this means plenty of free movement in the hand. The breathability of the palm-side leather also means less of a problem with sweaty, slippery hands. The main problem we’ve seen with these grips is a general concern for quality. They’ve not responded well to high-volume gymnastics work (the very purpose for which they exist) and the sizings themselves tend to be inaccurate based on the manufacturer’s size-guide. This is a problem for athletes with large or small hands, while the middle seems to have very few problems. The build-quality makes them difficult to use for some athletes, with the leather being easily stretched or deformed. Contrary to the problems seen with other leather grips, these are too pliable and likely to bunch in the hand – an easy way to damage the hands further. Overall, they’re struggling with a quality problem! The Aeolos grips are a leather-based product, though the actual design appears to be topped with a felt or similar soft, pliable material. This seems an unusual choice, and we’re confused as to how exactly Aeolos is trying to sell these as a 100% leather product with this type of design. Either it’s topped with another material, or the leather is poor-quality from the start. As with the JerkFit grips, the Aeolos grips provide an unnecessary and counter-productive wrist strap. 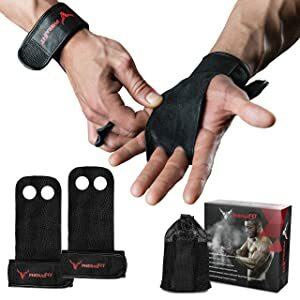 The problems with this are the same as those seen with the former product: it impedes movement of the wrist which is essential for various parts of CrossFit training – from weightlifting to skipping. If you’re wondering why tis is going to be a problem, think about it like exercising with a watch strapped, tightly, to your wrist. This is the kind of sensation you’re going to experience when dealing with this type of grip/support during weightlifting or skipping. This is uncomfortable, injurious, and definitely not helpful. If you can only use it for a few types of exercise, you’re going to have to take it off/put it on during a workout. Those are precious seconds added to your time, and any serious CrossFitter will know that can make the difference between success and failure. This is reason enough to look elsewhere for a better market-alternative! These are another leather product, though the texture and design are more durable. They’re reminiscent of the old-school gymnastic grips, which provides us with a lot of resilience and stability. The textured leather is great for added grip quality, while the soft-leather is a great balance of strength and flexibility. This makes them a good mid-ground for anyone looking for a durable grip that doesn’t require too much breaking-in or adjustment. This product will be great right out of the box. 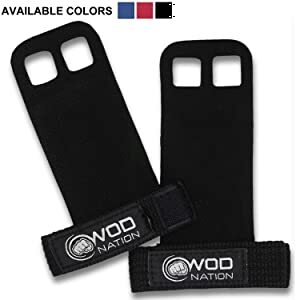 The only problem that consistently occurs with the WODfitters product is the fraying of the wrist strap itself. While the leather quality is great, the strap tends to be made of a low-quality synthetic weave, resulting in easy tears and fraying. This defeats the point of the whole product if it happens; you need an effective anchor point or the grip won’t have any use. These straps have even more concerns raised when you note the ligature marks they leave on the wrists. This is a bit severe for a product that s specifically designed to support the wrist and prevent damage to the wrists/hands. 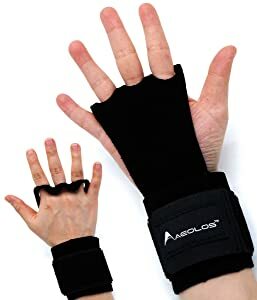 If you use these consistently you’re putting the tendons of the wrist at risk and you’re going to look like you’ve been held hostage for a month. At most, we’d say these are useful for beginners, but you’d need to be very careful with the buckle on the wrist strap. This is a travesty because everything else about this product is great! These hand-grips are a middle-of-the road. They provide a soft-leather grip with a heavy-duty nylon wrist strap. After the problems we’ve seen with the WODFitters strap, the size and build-quality of this strap is a reassuring sight! The leather itself is soft, coarse and flexible. This might raise some concerns for the longevity of the product – as it is likely to lose surface-mass over time – but it means a good balance between texture, durability, and flexibility. Overall, it’s off to a good start even it doesn’t promise a lifetime’s worth of use! The problem here is that over 20% of reviews are negative. The first, consistently-occurring problem is that the finger-holes are far too big. This is a problem because the slack here means they won’t actually protect the base of the fingers from damage, callouses and tears. The rips continue with the grips in place – making them mostly-useless. Overall, these are worth avoiding for the inconsistencies. More than 1/5 customers have a poor experience with these grips, and have almost no recourse. This is a risk that really isn’t worth taking when there are alternatives on the market! More than 1 in 5 customers complain about this product! If we’re pushed to make a decision on the best product we’ve reviewed today, we’re going to lean towards the ProFitness grips. This is down to two simple facts: the negative reviews tend to be the result of customer-error, rather than a consistent build or design flaw, and they provide a lifetime warranty. The value of a lifetime warranty on this product cannot be overstated. There’s no way to get better value for money than a lifetime warranty. This type of kit will break eventually and the opportunity to get another pair when this happens is absolutely amazing. This is unique to ProFitness and is the best assurance you can get. with this type of product! If it wasn’t tough, it’d not do its job! This type of product is going to be useful for protecting your hands, but it doesn’t require much more. It’s a simple set of needs and the features that try to complicate this process are historically more trouble than they’re worth. This is why we made it clear at the start: it doesn’t need to be fancy – any new features need to be well-integrated to justify their existence! Keeping it simple is the best way to go about building this type of grip – focus on the basics. It’s a lesson that any good athlete knows, and clearly ProFitness does too, as their product is our #1 choice!